Over the last few months, I’ve had several conversations about mobile business applications that remind me of early discussions and debates around SaaS a decade ago. When Emergence first invested in Salesforce.com in 2003, we heard all kinds of reasons why Software-as-a-Service wouldn’t work. Yet, cloud-based computing enabled a fundamental shift in software design, go-to-market strategies, and cost structure. Today SaaS companies are quickly coming to dominate the business application market. I feel like we are on the cusp of a similarly fundamental shift in business software. Once again, the change is about rethinking business applications, but this time it is with a mobile lens. When talking with companies that don’t have a specific mobile strategy, I keep hearing about how mobile is just a feature of cloud-based applications. Yet when we meet with entrepreneurs who are building “mobile-first” business apps, we can see a completely different way of thinking: Leveraging the unique capabilities of mobile devices is at the core of every decision they make. Vertical apps are defined by their singular focus on industries that have a substantial cohort of non-desk workers. Real Estate is a great example. The industry has been notoriously slow to adopt new technology, but in the last two years there has been an explosion in mobile-first technology solutions. For example, Cartavi’s mobile solution for real estate transactions gives agents, buyers, sellers, and related parties (mortgage banks, title companies, etc.) the ability to store, access, update and share transaction documents in the cloud. On the construction side of real estate, PlanGrid is eliminating reams of paper-based blueprints and change orders with a rich mobile app built specifically for the iPad. Given the field-based nature of the work and its traditional reliance on paper-based solutions, it makes sense that real estate is one of the most crowded boxes on the Emergence mobile business app landscape. Healthcare and education are other verticals that are particularly well-suited to mobile business solutions. In these sectors, most mobile business apps are enabling entirely new forms of communication, rather than replacing paper-based solutions. Doximity offers a professional networking solution for physicians that hasn’t existed before (Disclosure: The author’s firm, Emergence Capital Partners, is an investor in Doximity). More than 160,000 doctors have joined the network and over 75 percent of their engagement is through mobile devices. Other vertical categories including restaurants, transportation and hospitality have begun to attract attention, and we predict that we will soon see more apps in the manufacturing, retail and agribusiness verticals, given the “always on their feet” nature of the workers in these sectors. Looking at horizontal apps, most start-ups emerge in three sub-sectors: productivity; mobile marketplaces; and sales, marketing and services. A defining characteristic of the companies in the productivity space is their focus on leveraging the native integration of email, desk and calendar in mobile devices. For example, Tylr Mobile has recently launched a new mobile app for salespeople called Workinbox that directly connects salesforce.com data with email. Another young company, Cloudmagic, has developed mobile search capability that allows users to find names, documents, or other files stored in any of your cloud-based applications (e.g. email, calendars, Box, Evernote). In the mobile marketspace sector, many business apps share a heavy reliance of location-based services. There are several promising car service companies such as Uber, Flywheel, Hailo, and Taxi Magic that enable drivers to find passengers through a marketspace leveraging GPS data. Another interesting company, Quri, has developed a mobile platform that uses both GPS data and mobile cameras to crowdsource in-store intelligence for consumer brands. Within the sales, marketing & service, ServiceMax, has developed a mobile solution that helps companies manage the entire field service process including scheduling, parts and contracts (Disclosure: The author’s firm, Emergence Capital Partners, is an investor in ServiceMax). The company sells into over 20 verticals, and its bookings increased over 150 percent relative to last year. As we think about the other horizontal sub-sectors, some companies that stand-out have found innovative ways to use mobile cameras (Expensify, Flint), alerts (PagerDuty), and even the headset jack (Square). At Emergence, we feel optimistic about the tremendous growth in mobile business applications that we have seen over the last 12 months. However, like all nascent categories, there are many unsolved challenges. Distribution issues come up during every conversation we have with entrepreneurs. All mobile business app entrepreneurs want to figure out how to leverage mobile app stores more effectively, but most struggle to do so. In addition, founders are working through the question of whether to native-build mobile business apps or to use a browser-based approach. To date, I have found that native apps tend to provide a better user experience. Further, business users often like access to their applications even when they don’t have connectivity – which makes native apps a better choice today. However, developing and maintaining native apps across multiple platforms is challenging and costly. I am hopeful that the evolution of HTML5 will help entrepreneurs achieve the benefits of both. As we look ahead, we know the mobile business app landscape will continue to evolve. We realize that we have likely missed some great companies, so please let us know if we missed you. Or if you are thinking about other ways to categorize the companies, it would be great to share ideas. Kevin Spain is a General Partner at Emergence Capital Partners, a Silicon Valley venture capital firm focused on Enterprise SaaS. He sits on the board of several companies, including Doximity, Viglink, and Welltok. Kevin, thank you very much for this great post! Our company has mobile business app for car dealers which helps them to communicate with their customers via smartphone – http://www.dealermobility.com. We sell this application as SaaS in Russia and looking forward to go to international markets. Kevin, thank you very much for such great post! One of our companies has mobile business application for car dealers, which helps them to communicate with their customers – http://www.dealermobility.com. We sell this application as SaaS in Russia and looking forward to start selling it at international markets. Great write up on this emerging category. Really encouraging to see Emergence taking an interest here too! I wanted to let you know about what we’re doing at Device Magic with our Mobile Forms platform (www.devicemagic.com). Some things that set us apart IMO – fully native apps for each platform; cloud backend with versatile output options (Google Drive, PDF, Word, DropBox, Box, XML). Last but not least, a bi-directional API to get data into and out of the field via push notification on the various platforms. Thanks for highlighting the importance of mobile apps and the benefits they can bring! 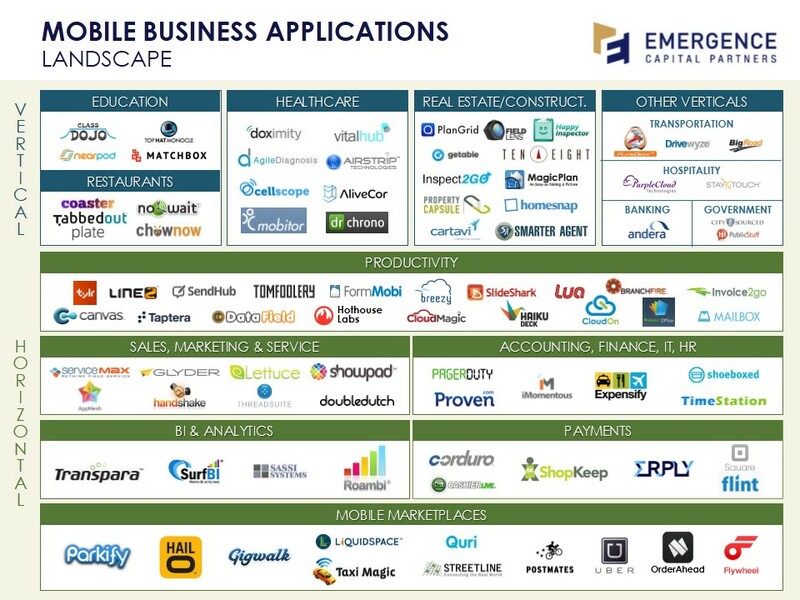 Great summary of the mobile business app landscape! We are a small group of folks who are also thinking long and deep about how productivity apps need to be refreshed and reinvented for the Post-PC era. We recently released our first effort in this direction – a presentation app called deck that allows you to effortlessly create beautiful presentations on any mobile device. Please take a look at it at http://www.deck.in if it might be of interest. Great post Kevin, flattered that you highlighted Tylr Mobile. This is a much-needed first step to catalog this vibrant market by describing “what” these apps aim to do. What’s next? A more nuanced discussion for “how” these apps are built. The technology industryâ€™s conversations about the cloud took a giant step forward when we started to agree on how to talk about the â€œhowsâ€ of cloud computing. Were we talking about public cloud? SaaS, PaaS, or IaaS? Multi-tenant? Different vendors had different answers to these questions, and the answers told us a lot about where that vendor stood in the transition to cloud computing. So far, our discussion about business mobile apps is a lot less nuanced. We need a better way to describe the â€œhowsâ€ of a mobile business app. We donâ€™t have this vocabulary yet, which is why we spend half our time here at Tylr Mobile talking about what weâ€™re doing, and half our time talking about how weâ€™re doing it. Great thoughts, Ryan — and I really like your post. Keep up the good work at Tylr! Glad to see Datafield (www.data-field.com) included in your landscape. On our side, we believe that native is the way to go if we want our app to be opened more than once a day. Of course, having a web app offers flexibility but could not match the native experience + power. This trend will not change as device manufacturers will keep adding features only available through their SDK. Antoine, native is certainly harder to manage as a developer — but as I mentioned in the post it undoubtedly delivers the best user experience. Your point that a native app drives more usage is a very good one. You can certainly “bookmark” a web app on your smartphone/tablet’s homescreen, but few users actually do this. Chalk up another advantage to native apps. Kevin, my company Inkscreen (www.inkscreen.com) would fall into your Productivity matrix. We’re working with partners like Good Technology to secure our application and connect it with existing business applications (email, sharepoint, cloud services like Box, etc.). While the Good platform isn’t perfect, it does address many security and “data connectivity” issues allowing you to walk the fine line between IT and business user usability requirements – and therefore avoid being the dreaded “stovepipe”. Josh, thanks for your comment. I appreciate the heads up on Inkscreen! Looks like you guys are working on some interesting things. Nick, security and management issues are critical when it comes to any business app — mobile or otherwise. Mobile presents some new and interesting challenges, though. I like the emerging group of “post-MDM” players such as Enterproid that are rethinking how to enable app-level security. This is certainly a space to watch. Having all of these apps is great…but what are enterprises doing to secure the data? I think you should cover the business app security players as well. One such company is Mocana with its Mobile App Protection (mocana.com/map). Securing the data will be important when you talk about BYOD where a managed device is not possible…..think partners, contractors, and even customers. This is where the extended enterprise will go…enabling your entire ecosystem with mobile apps…..
Tushar, you raise an important point relative to app security. This is mission-critical in the business app world. That said, our landscape deliberately focuses on the app layer of the stack (which is where we at Emergence have a lot of history having invested in companies such as Salesforce, SuccessFactors, Yammer, and Box). We may consider adding companies in other parts of the stack in the future. If we do so, rest assured that companies like Mocana will be included. This is a great article Kevin! Enterprise mobile apps is an area we think will explore over the next few years. Until now, most VC firms have taken the approach to wait and see until the market matures a little bit. Good to see Emergence is fully invested in the space. We are super bullish on this market and even launched an enterprise mobile-first backend as a service (http://www.kidozen.com/) to help organizations build the foundation of a mobile first enterprise. Thanks, Jesus. Glad you enjoyed the post. Would love to connect at some point and learn more about what you’re working on. Kevin, nice work in raising the bar on conversations around this growing market. We are a organisation that builds mobile applications for the enterprise and government, focused entirely on the challenges you outline here. For us, we only engage via our mobile business design team in the first instance….why, because we believe the real opportunity for well designed mobile applications rests in a thorough understanding of business process, and process re-engineering in the first instance. Coupled with a deep analysis of the user and user experience, mobile applications that disrupt current business models and process are where the advantages are. Increasingly, we are seeing more mobile first approaches to new concepts and business process as we work closely with our customes to help them understand the roi and benefits of mobile applications. To date, also, most of our work has been in native as systems integration, data management and ux are simply too vital to achieving real benefits. Price is irrelevant, we believe that our work is an investment for a business and not a cost. Look forward to the continued conversation around this subject. Luke, thanks for the comment. Feel free to send some information along on your company. We want to ensure we track and include more great mobile business app companies in the next version of our landscape. Kevin, nice analysis. It would be interesting to understand how these APPs interface with existing enterprise data. As you know core enterprise processes leverage data in either SAP, Oracle or Salesforce for a large majority of enterprises. Customers are looking to extend existing process workflows on mobile, such as expense reimbursement, purchase order approval, with mobile APPs. In addition, they are also looking to develop extensions to existing APPs on mobile as well integrate new Mobile First and Mobile Only experiences. Building a Mobile APP is relatively easier than tieing the APP into an exsting business process and data. Akash, you pose a great question. Today, many mobile business apps are stovepipes (they don’t connect to other enterprise systems easily or at all). However, I’m confident we will see this change in the same way we’ve seen SaaS applications become more integration-friendly over time. Entrepreneurs are still figuring out the mobile business app space — and integration is one of the challenges that hasn’t yet been tackled by most. Good topic to discuss Kevin. As Willy Sutton said when asked why he robs banks “that’s where the money is” and this is and always will be true for the enterprise. Mobile is relatively new in business. to wit, Obama’s announcement for the candidacy for POTUS is older than the iPhone. So much innovation is left to do. Fred Wilson and others call it “mobile first” but in time it will simply move to “work anywhere, anyway” as cross platform UX/UI integration matures. Having a background at Dell and Oracle has benefited us well at WhoAt.net as we’ll already be integrated with ERP systems when we hit general availability. SSO, security and compliance with BYOD policies and comporting with data ownership matters are key items for new mobile companies interested in the enterprise space to address before they GTM. It is not surprising that your conversations with entrepreneurs are often times focused on distribution. If there’s one thing you learn at Dell, it is the importance of channels. The good news for enterprise businesses are they should really care less about the app stores so long as their product name shows up easily when proactively searched. Yes, it is nice to acquire customers via that channel natively, but far more risky of a strategy. Far more distribution partnerships are available and should be taken advantage of. It would be great to hear your (and others’) thoughts on how best to solve the mobile distribution challenge for business apps. There’s a huge advantage that will accrue to entrepreneurs who figure this out first. Viral hooks and direct telesales are the “easy” answers and are obvious avenues that need to be executed upon. Real viral is always hard and sometimes mutually exclusive in enterprise businesses, but not always. Venture investors tend to also shy away from push sales models but, in truth, most all successful enterprise businesses include some form of a push model. It is just they’re more attractive if they’re supporting a pull through sales model and appending the model rather than needing direct sales to prove out CAC vs. LTV metrics. Websites supporting your mobile apps with added functions not best suited for the mobile UI in the â€œwork anywhere, anywayâ€ approach are important to so they can be more connected to enterprise systems. This also enables them to better tap into horizontal or vertical enterprise consulting businesses partners that are looking for additional integration and customization services revenue due to the loss of old, large scale ERP driven projects going/gone away due to lighter weight SaaS integration. I’ve also found it interesting that so few “mobile first” application firms haven’t embraced the IP telecom revolution and found ways to integrate and add value to the VoIP, UC and upcoming WebRTC communication technologies that are obviating the need for a handset on your office deck. The telecom world calls them OTT or “Over the Top” services to the carrier’s network. If you’re building enterprise mobile apps and not thinking about the fact that your app is on a phone used for business, and is or will be integrated into the corporate phone system, then you’re missing a potential critical channel development opportunity. To accelerate the speed of user growth, our approach has also been to find adjacent business problems to our core value prop and build APIs around those, use them ourselves so we’re eating our own dogfood, then offer them as revenue sharing affiliate programs to other websites to help them solve that specific problem you’re able to fix, thus building traffic for your core business. I think the firms projecting this “build it and they will come” mirage that all you need is a great UI and simple experience and solving a really important business problem and customers will flock to you, but ignoring the channel issue leave themselves to be vulnerable long term when then next hot product comes along and out executes them on the product problem. (think PointCast and Netscape here as two examples that flamed hard and I think some in the online file storage industry will go the way of the DoDo bird in time too) Being integrated and having channel partners profiting from your value prop is a less risky strategy. You just need to focus on it and really understand where the nooks and crannies are the largest. Sorry for the long answer, but wanted to address your question and help other entrepreneurs as much as I can. Contact me if interested in discussing more. I’m easy to find on the web. We are a specialist of SaaS integration. Our iPaaS is covering SaaS integrations but we are actively working on mobile integrations (a mobile middleware in a way). Happy to discuss with you if interested. Kevin, thank you for the inclusion in the Healthcare Landscape above. Akash, our company, Mobitor, does exactly what you describe. We found that the specific workflow and user interaction touch points in the medical device supply chain process are inherently suited for a mobile first strategy. Due to that, we have focused the majority of our user interface resources on our native mobile applications. This involves UX and UI as well as more challenging aspects such as working offline and seamless device to cloud syncing. Even though we consider ourselves â€œmobile first,â€ itâ€™s just the tip of the iceberg for our platform. We see backend integration as the real power in this business app space. For example, the ability for sales reps to complete simple tasks via their mobile device that trigger complex business processes that span backend systems such as Oracle and SAP to perform tasks such as PO generation, replenishment orders, invoices, notifications, etc. These integrations are all powered by the growing availability of Enterprise SOAP and REST web services. By providing our users with an optimized mobile experience, they are more likely to make our application an integral part of their daily workflow, which benefits the entire demand/supply chain and ultimately results in extremely low or no customer churn. Phenomenal work to you and your team Kevin. I think there are quite a few fundamental challenges that mobile first companies face. From having a disciplined product development process to finding the innovative distribution channels. Initially, we found that there was a huge education component needed as well. For example, bridging the gap between the consumer’s expectation of $0.99 apps to closing larger enterprise technology sales. One thing we’ve seen in our time in the market is that our customers have warmed up to this change. Kevin, I believe that the cloud is very important in building a substantial business and almost crucial when it comes to B2B products. Do you know any of the above companies that’s just “an app”? Jindou, most of the successful business app companies I’ve seen (and most on the landscape) rely on a cloud-based back end. From user authentication to connectivity with other cloud-based systems, there are many reasons why having a connection to the cloud is critical for any business app — mobile or not. Nice analysis Kevin. It would be interesting to map how many of the 100 mobile apps for the enterprise that you list also have a Web app. My experience is that people expect to work anywhere on any device. Each computing platform has its advantages and disadvantages, including smartphones and tablets (e.g location). And because customers expect to be able to work from anywhere, forcing a “mobile first” dialogue is critical because it has not been the natural thought process for most product builders. We are thinking “mobile must” with our new company and hope to make your next list with Aha! (www.aha.io) which is the new way for agile companies to set brilliant product strategy and roadmaps. The point of the landscape is to show companies that think mobile first — and that have architected their apps to take advantage of the unique capabilities of mobile platforms. Sometimes, having a Web component to their offering adds value, though not always. I would argue that as we see more and more business users develop a preference for using mobile devices for a greater portion of their work, a Web companion might prove less necessary as time goes on. Brian, we are doing just that mapping at https://starthq.com at the moment. Will comment here and post on Twitter once we have some preliminary data.